(Bloomberg) -- Rahul Gandhi, president of India’s main opposition Congress party, said his party will fill 2.2 million government job vacancies by March 2020, if voted to power, while Prime Minister Narendra Modi showcased the government’s decisiveness in handling terrorism as political parties wooed voters. Better employment opportunities is the top priority of India voters, according to a survey by the Association for Democratic Reforms, an election watchdog. Indians are dissatisfied with the government’s performance on issues such as jobs, healthcare, drinking water and public transport. Lack of employment opportunities and rising prices were the most pressing challenges for more than 70 percent of people surveyed by Pew Research Center last year. 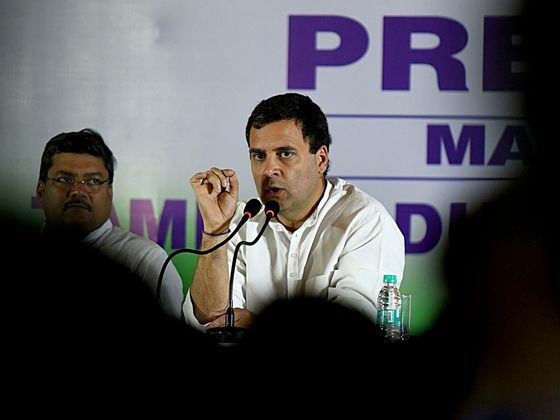 The Congress party is seeking to wrest power from Modi’s ruling coalition in the elections that will take place in seven phases between April 11 and May 19, with results to be announced on May 23. Modi has been criticized by the opposition for not fulfilling his promise of creating 10 million jobs each year -- a pledge that helped him win over India’s youth in the 2014 election. The ruling party denies this charge. It has created enough jobs by doubling the pace of making roads and railways, built 80 million toilets and 25 million homes in a country that has one of the fastest growing economies in the world, said Amit Shah, president of the ruling Bharatiya Janata Party, in an interview to the Economic Times. “The problem is not a crisis of jobs but a crisis of data,” he said. Indian equities benchmark was set to close at a record high. Expectations that the central bank will announce its second interest-rate cut this year and the election will see Modi reelected has helped lift investor sentiment. 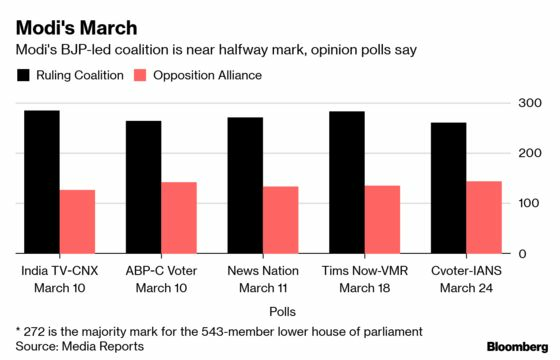 While any single party may not get a majority, a strong showing for the BJP in the Uttar Pradesh state would go a long way to ensuring that it can form a dominant and stable coalition, Shilan Shah, senior India economist at Capital Economics Ltd. said in a March 29 report. This would ensure that it can continue implementing gradual structural reform over the coming years without having to keep too close an eye on fractious coalition partners, he said. Congress’ income support plan may be fiscally prudent if it offsets existing subsidies, which amount to about 3.2 percent of GDP, Sonal Varma and Aurodeep Nandi, economists at Nomura, said in a note on March 26.